Yep, the popular riverboat has personalized steamcoaches decorated to look like their namesake. And they sure are getting second looks whenever they pass by. 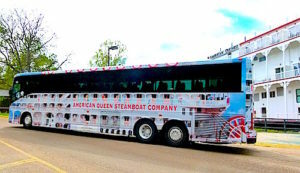 The colorful motor coaches are painted to closely resemble the exterior of the American Queen – big sister to the American Duchess – complete with the big red paddlewheel and “passengers” waving from the decks. People stop and stare at the unusual touring vehicle. It certainly is easy for American Duchess passengers to identify their special bus when it pulls up. Along with the steamcoaches, the American Duchess offers another perk I really appreciate. Shore excursions are free. Bus tours at riverside ports are included in the basic fare. On other cruises, those shore tours often cost $70 to $120 each. The well-organized program allows passengers to pick up a special American Duchess map for each town where we dock, hop on a comfy large steamcoach, hop off at one of the attractions on the map and hop back on for the next stop or to return to the boat. The steamcoaches make their rounds about every 15 minutes. Some passengers just like to ride the whole loop first to get the lay of the land and then decide where to get off. The maps are very easy to read with a thick red line showing the steamcoach route, stops at attractions along the way, layout of the town’s main center and where the boat is docked. Each shore stop seems to have about six attractions with free admission for American Duchess passengers. The Duchess does offer premium choice tours, which cost extra but I was very pleased with the free ones. A premium tour in Natchez, for example, offered “The Story of Cotton in the Antebellum South” which included a visit to Frogmore Plantation, the only cotton plantation in the south that allows guests to tour both the historic and modern-day aspects of cotton operation. At Frogmore, guests also get to see a musical performance illustrating the struggles of life on a plantation. Tour guests get to view the cotton fields, restored slave cabins and a rare steam engine cotton gin. Cost for that tour was $79. On the other hand, the free tour in Natchez included stops at Rosalie Mansion, the Visitor’s Center, William Johnson House, Magnolia Hall, Stanton Hall, King’s Tavern and Charbonneau Distillery and the Natchez Association for the Preservation of Afro-American Culture Museum. Since the American Duchess has been cruising the river only since Aug. 14, 2017, we were greeted at shore stops by very happy business owners, grateful to have so many potential shoppers brought to their doors. When the riverboats stopped running some years back, many of the smaller shops that depended on river traffic went out of business. The American Queen and the American Duchess provide very important economic boosts to cities and towns along the rivers. The steamcoaches are also unusual in that they follow the vessel along its cruise itinerary route. That really makes sense – not only because it is nice to see familiar coach drivers and guides but also because it assures that the bus will actually be there. One time, I was on a Mississippi River cruise with another cruise line where passengers climbed a steep hill in the heat to catch a scheduled bus to take a tour. An hour went by and the rented bus still hadn’t arrived. When the cruise director called the bus company, she learned that they had forgotten about the reservation and would be happy to send a bus on its way. Too late. Not a good thing. That tour was cancelled, of course. Passengers were unhappy because they had looked forward to the tour and waited in the heat. Cruise line representatives were unhappy because their passengers were not pleased and because the cruise line had to refund the tour fees to passengers. And that bus company sure got a serious black mark against its reputation. On my American Duchess cruise, however, we would see the steamcoaches waiting on shore when our boat pulled in for a stop. A comforting sight. The American Queen Steamboat Company’s steamcoaches are just another example of the thought and care that go into the line’s desire to make steamboating a well-organized and memorable adventure.